Is your cat tired of playing with the same old ball of yarn and empty shipping boxes? To be fair, they never get tired of empty boxes but it may be time to step up your cat’s game. Add exciting, interactive play to your cat’s day with the Jackson Galaxy Telescoping Wand Cat Toy, created by a cat expert who truly knows what cats crave. In households with more than one pet, there’s usually a natural bit of back and forth wrestling that keeps them active and engaged. However, if your cat is a loner your assistance may be required to sustain a healthy level of exercise and interaction. Without daily playtime, many cats may become overweight and disinterested in activity. This can lead to health problems including joint stiffness and a general decrease in vitality. Below are a few of the many benefits of daily play with your cat. Eye-paw coordination is essential to a cat’s survival in the wild, as is the stealth to sneak up on potential prey. Playing is vital to keep those instinctual skills honed, especially for indoor cats. For housecats, it’s important to stimulate these natural instincts to keep them happy and healthy. What are the best cat toys for indoor cats? Cats have different interests when it comes to playing. While some have a need for speed, other cats enjoy a slower pace with a little suspense. Cat play can range from sneaky stalking to a full-on bunny kicking attack in the blink of an eye. Choosing a cat toy that appeals to your cat’s personal playing style will help keep him or her playing longer. While your cat will likely enjoy any interaction with you on a regular basis, playing satisfies many feline physical, emotional, and psychological needs. When you are controlling the speed and intensity of the game, your cat will be more inclined to participate with enthusiasm. To further enhance your playtime, choose cat toys that appeal to your cat’s individual preferences. Find out if your cat is more responsive to dangling a toy in the air or dragging it across the ground. 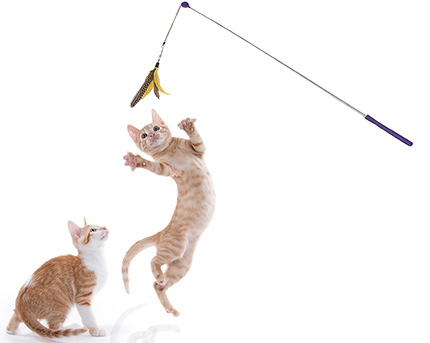 This will help you choose the best cat toy to appeal to your cat’s natural hunting tendencies. Celebrity cat expert Jackson Galaxy has created the cat toy that will take your kitty’s playtime to the next level. The Jackson Galaxy Telescoping Wand Cat Toy is designed to capture the attention of cats based on an interest in air prey or ground prey. If your cat loves chasing birds, moths, and butterflies, the Jackson Galaxy Telescoping Air Prey Wand will inspire spirited leaping and swatting. The lightweight tether attached to the feather toy allows you to control the game with a gentle wave of your wrist. The simulated flight is lifelike and exciting to cats who love all things that swoop and flutter. If your cat is more interested in little creepy crawlies that skitter away, the Jackson Galaxy Telescoping Ground Prey Wand with Caterpillar Toy might be the best choice. The jointed yellow and black striped caterpillar mimics the movement of insects across the floor, around corners, and under furniture. Is your cat the brave, King of the Jungle type? Try the Jackson Galaxy Telescoping Ground Prey Wand with Iguana Toy for cats who like to take on larger prey. The chunky, jointed lizard toy will feel like a real trophy catch to your pint-sized panther. Both Ground Prey toys have jointed bodies that wiggle and writhe to simulate scurrying. The Air Prey Wand has a retractable line for easy storage. Ground Prey Wands have a flexible, springy wire tether that helps move the attached toy with erratic, lifelike motion requiring minimal effort. All three Jackson Galaxy Telescoping Wand Cat Toys have telescopic handles to let you stay far enough away from the action to truly ignite your cat’s imagination. If your cat is the type who likes to chase everything and anything, get one of each! 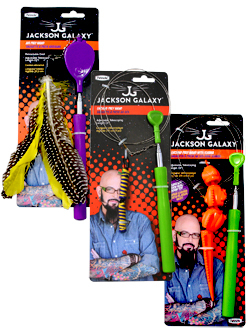 Win a FREE Jackson Galaxy Telescoping Wand Cat Toy! Would you and your cat enjoy some crazy playtime with a Jackson Galaxy Telescoping Wand Cat Toy? Just leave a comment below for a chance to win a FREE Jackson Galaxy Telescoping Wand Cat Toy from 1800PetMeds! One winner will be chosen at random on Wednesday, March 1, 2017, so everyone who participates has a chance to win! (Limited to residents of the U.S.) Good luck! We decided to give away TWO toys! Congrats to the drawing winners, Amanda F. and Dawn. Look for an email from us about how to claim your prize. My cats would love to win this awesome toy. My babies Peaches and Frank Sinatra would love these toys. They love to hunt, jump and chase things!!!! We have 5 cats, we need all the help we can get when it comes to cat toys! Would love this for my cats. THANK YOU FOR READING ABOUT MY VERY MUCH LOVED CAT FAMILY. WE PLAY, WE LOVE AND WE HUG..THEY ARE SO MUCH FUN AND THEY LITTERALLY ARE MY LIFE..IF I SAY DINNER TIME THEY ALL COME BECAUSE THEY KNOW.. IF I SAY LETS GO OUTSIDE THEY ALL HEAD FOR THE DOOR AND REACH FOR THE KNOB.IF I SAY IT’S BED TIME THEY ALL HEAD FOR BED TILL MORNING .IF THEY WANT TREATS (IE ) COOKIES THEY KNOW HOW TO GET MY ATTENTION AND WHERE I STORE THEM. THEY EXERCISE EACH OTHER IN SCRAMBLES AND YES SOMETIMES SLAPS..NEVER A FIGHT. ( WELL MAYBE A LOUD GROWL SOMETIMES. THANK YOU AND I NEVER MISS JACKSON…HE IS AMAZING, AMUSING AND I HAVE LEARNED A LOT. My cat loves playing with my homemade cat toy on a stick. This looks like he would have a lot of fun with it! My cat, Cinnamon, loves to play with strings and other toys. I know she would love this! Lil Buddy would love one of these! He’s a feral kitten that decided to move indoors. My older cat isn’t interested in running and jumping. So, this toy looks like fun.